Brand Nu Words is focusing on its classic book, Nappy for February (Black History Month), March (Women’s History Month), and April (National Poetry Month). Check back often for Brand Nu Content! 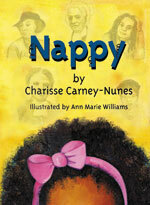 Brand Nu Words is giving away FREE eACTIVITY BOOKS to reinforce the lessons from Nappy. Our mazes, word jumbles, crafts, games and writing exercises will keep first - sixth grade students engaged, while reinforcing cognitive skills and lessons in history. Enter your name and email address then select the activity book suitable for your children and let the fun begin! Terms & conditions: Brand Nu Words and Charisse Carney-Nunes grant a limited license for a single individual to download a single copy of this activity book and to reproduce it no more than 30 times. Brand Nu Words and Charisse Carney-Nunes also grant a license to link to the versions of this activity book posted on the Internet by the publisher or author. Except for these limited licenses, no part of this activity book may be reproduced, emailed, posted or shared via social networking, stored in a retrieval system, or transmitted in any form by any means, electronic, mechanical, photocopying, recording, or otherwise without the prior written permission of the author except in the case of brief quotations embodied in critical articles and reviews. All rights reserved under United States and international law. Inquiries/permissions requests should be addressed to info@brandnuwords.com/202.460.5168. Brand Nu Content coming soon!